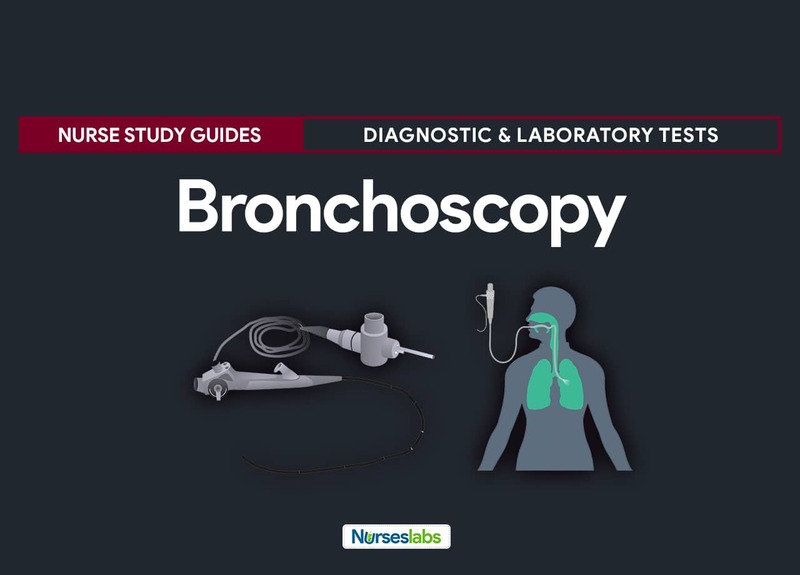 Everything nurses need to know about bronchoscopy. 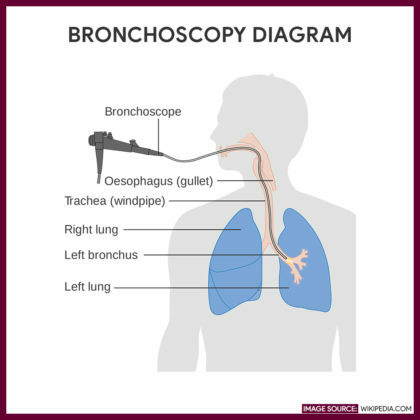 Bronchoscopy is an invasive procedure that permits the direct examination of the larynx, trachea, and bronchi using either a flexible fiberoptic bronchoscope or a rigid metal bronchoscope (see gallery below). It is performed by a trained practitioner (pulmonologist or thoracic surgeons). 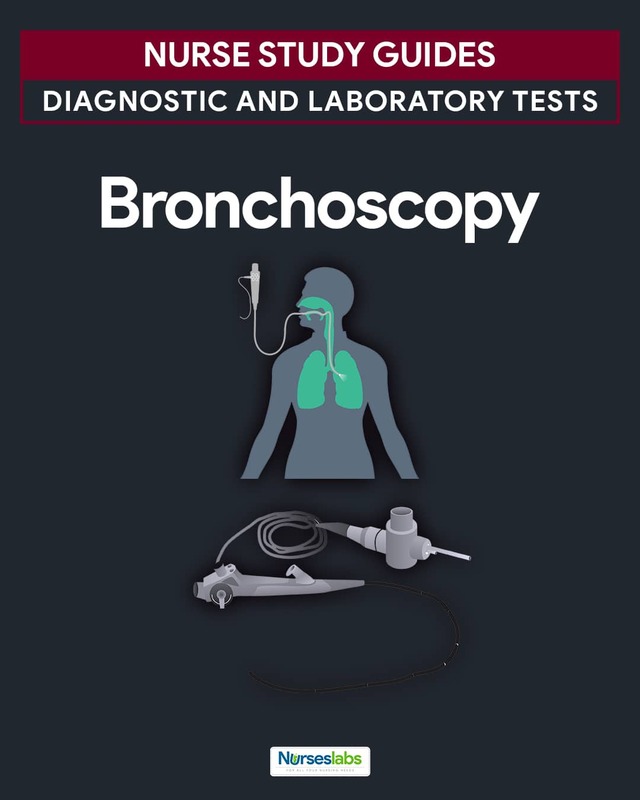 A non-invasive approach called virtual bronchoscopy includes a series of computed tomography (CT) scans to visualize the tracheobronchial tree. 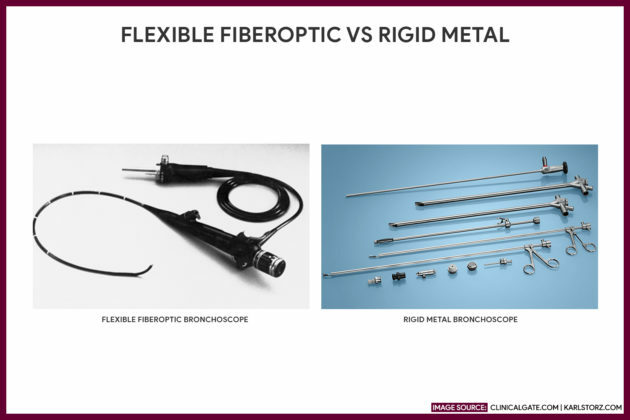 While a flexible fiberoptic bronchoscope is used more often and provides a wider view, the rigid metal bronchoscope, on the other hand, is a method of choice for foreign body removal, endobronchial lesion excision, and massive hemoptysis control. A bronchial brush, forceps, and needle may be passed through the bronchoscope to get samples for cytological determination. 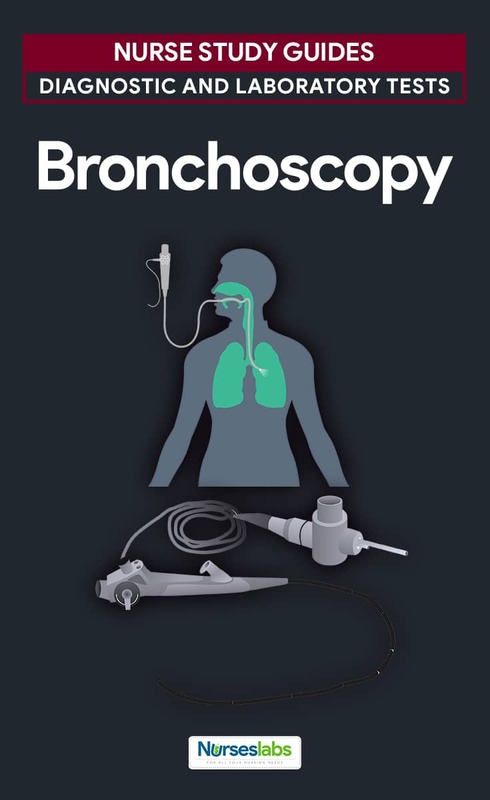 The nurse’s responsibility during a bronchoscopy includes maintaining a viable airway and closely monitoring the patient’s respiratory status. Another role of the nurse during the bronchoscopy is to relieve patient anxiety by providing information on what to expect and what to avoid. A local anesthetic is flushed into the throat patient’s throat on a sitting upright or lying supine position. As the sedative takes effect, a bronchoscope is inserted through the patient’s mouth or nose. When the bronchoscope reaches above the vocal cords, about 3 to 4 mL of 2% to 4% lidocaine is sprayed through the scope’s inner channel to the vocal cords to anesthetize distant areas. 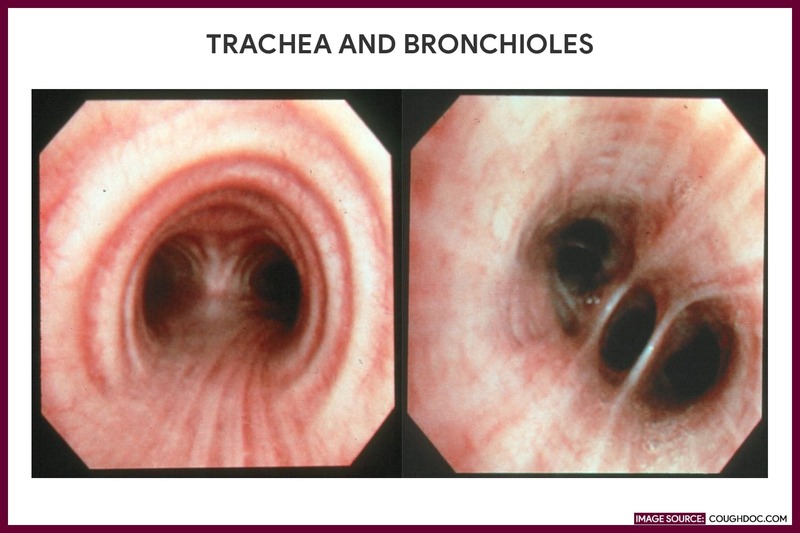 The practitioner examines the anatomic structure of the trachea and bronchi, notes the color of the mucosal lining, and inspects for tumors or inflamed areas. 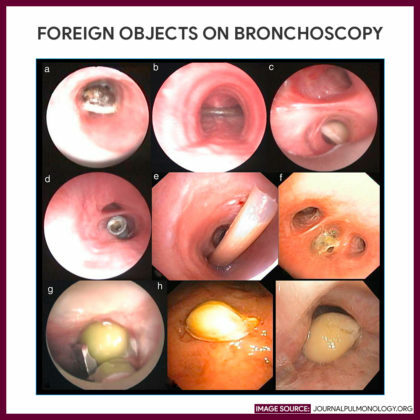 Tissue samples may be collected from a suspect area; A bronchial brush is needed to collect sample cells from the surface of a lesion, and a suction apparatus to remove foreign materials or mucus plugs may be used. 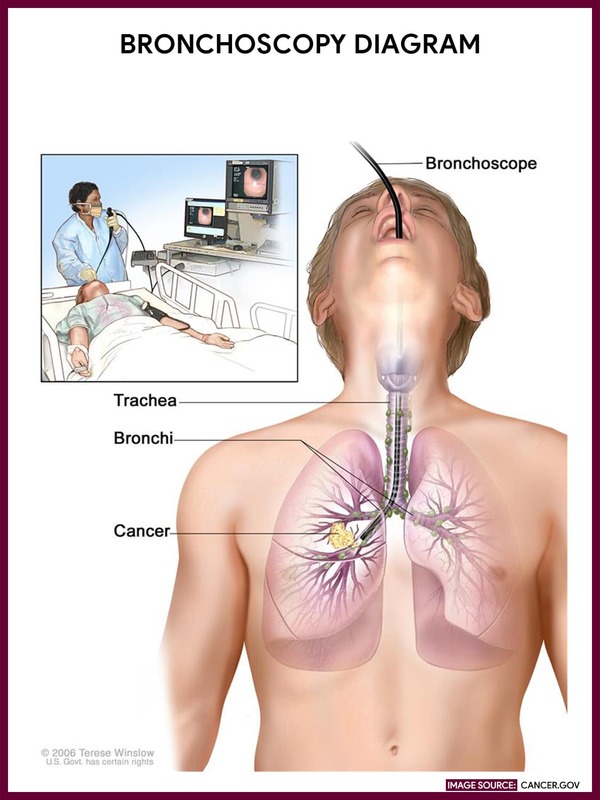 Bronchoalveolar lavage may be performed to diagnose the infectious causes of infiltrates in an immunocompromised patient or to remove copious secretions. IMPORTANT Secure informed consent. A signed consent form is obtained from the patient. Obtain medical history. Ask for any history of allergies to anesthetic agents and list of medicines the patient is taking. Check for NPO status. Withheld food and fluids for 6 to 12 hours prior to the exam to decrease the risk of aspiration. Monitor vital signs. Obtain baseline vital signs and inform the practitioner of any abnormal findings. Provide oral hygiene. Instruct the patient to do oral care and remove any dentures if appropriate. Administer preoperative medications as ordered. Explain to the patient that an IV sedative such as Propofol may be given as an anesthetic agent. Prepare for local anesthesia. If the bronchoscopy is not conducted under general anesthesia, inform the patient that a topical anesthetic (e.g., Lidocaine) will be sprayed on the pharynx to prevent coughing and gagging as the scope is passed down through the throat. Explain that the spray may have a bitter taste to it. Relieve anxiety. Reassure the patient that airway blockage won’t occur. Prepare emergency resuscitation equipment at the bedside. Laryngospasm and respiratory distress may occur following the procedure. Position the client. Place patient in a sitting or supine position and provide supplemental oxygen as ordered. Provide assistance with the diagnostic procedure and/or treatment. Assist with tissue specimen collection for testing. Other procedures may be performed as needed such as removal of foreign body, bronchoalveolar lavage, placement of a bronchial stent, and aspiration of retained secretions. Secure specimen. Send the properly labeled specimen to the laboratory immediately. Assess bleeding episodes. Observe the patient’s sputum and report for any excessive bleeding. Explain that a minimal amount of blood streak is expected and normal for few hours after the procedure. Assess respiratory status. Watch out for signs of bronchial spasm or bronchial perforation such as facial crepitus, hypoxemia, hemorrhage, and chest tightness. Monitor vital signs. Changes in the vital signs or any discomforts felt by the patient may indicate a possible complication. Position the patient. Place the conscious patient in a semi-Fowler’s position while for an unconscious patient, place on one side with the head of the bed slightly raised. Reinforce diet. Maintain NPO status until the anesthesia has worn off and the gag reflex has returned. The patient may resume his normal diet, starting with sips of water or ice chips. Prevent aspiration. Provide an emesis basin, and instruct the patient to spit out saliva rather than swallow it. Relieve anxiety and provide comfort measures. Reassure the patient that hoarseness, loss of voice and sore throat may occur temporarily. Offer lozenges or a soothing liquid gargle to relieve discomfort until gag reflex returns. The abnormal results following a bronchoscopy. Bleeding from the site of the biopsy. Bleeding can happen when tissue specimens are taken during the procedure. Fever. A low-grade fever is usually common but it is not always an indicator of an existing infection. Hypoxemia. Low blood oxygen concentration that occurs during the procedure and the level usually returns to normal without any intervention. Laryngospasm. irritation or spasm of the larynx (vocal cords). Pneumothorax. or a collapsed lung. This happens when the lung is punctured during the procedure. The flexible fiberoptic bronchoscope (L) is used to providde a wider view. The rigid metal bronchoscope (R) is used for foreign body removal, and massive hemoptysis control. Chernecky, C., & Berger, B. (2013). Laboratory tests and diagnostic procedures. St. Louis, Mo. : Elsevier/Saunders. Wolters Kluwer Health/Lippincott Williams & Wilkins. (2009). Critical care nursing in a flash. Philadelphia.